It's designed to combine fun with some serious research about the motorway network, including some plans that never got off the ground. You will find no speculation here, just cold hard facts. Well, other than the occasional April Fool's Day hoax, that is! People have this idea that motorways are dull, wide, fast roads that traverse the country from one end to the other. What makes a motorway pathetic? Well, that rather depends on the motorway. Some are pathetic due to their sheer length (or lack of it!). Some because they're not even dual carriageways, and some simply because there's something, perhaps even a single feature that's really quite daft about them. Some are pathetic simply because they never came to pass - or were never finished. A Pathetic Motorway might be short. It might have a really daft feature, perhaps a junction. It might simply be quiet! It may even be useful, but not well-known outside its local area. The M1, M6 and M25, for example, are not pathetic motorways, despite evidence to the contrary! Yes, absolutely. We might have a tongue-in-cheek style, but there's deadly serious research going on behind the scenes. 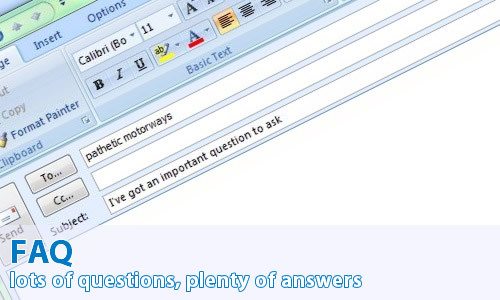 PM is used as a source within the Highways Agency, including sending people to us with queries that they can't answer, and also by the National Archives. In addition, we are regularly requested for interviews from national media such as BBC Radio 4, BBC Radio 5 Live and BBC Radio Wales; a whole bunch of regional BBC Radio stations including Leeds, WM, Surrey, Northamptonshire, Sheffield, Lancashire, Three Counties and Cambridgeshire as well as regional independant radio such as Capital Radio, Beacon FM and Wave 105. We've also been in The Telegraph and also have appeared on BBC1 in prime time, as well as featuring as a further information on BBC Four's documentary series "Secret Life of the Motorway"
PM has a bit of a cult following - we're even listed as one of confused.com's Brian the Robot's favourite websites! Which are the shortest and the narrowest motorways on the site? The shortest is the 330 yard (300 m) long A635(M) in Manchester. The shortest non-secretive motorway is a toss-up between the A64(M) in Leeds, and the A308(M) in Berkshire. One carriageway of the A64(M) is a lot shorter than the other, but the average length of the two is a few yards longer than the A308(M). The narrowest motorway is one of the single-carriageway motorways. The southern section of the A601(M) appears to be the narrowest of them at two lanes wide. The (now former) A6144(M) is two lanes and a central painted section wide, and the Walton Summit Motorway is three lanes wide. Which counties have the most motorways featured? Not surprisingly, Lancashire - home of the first motorway. There are an astonishing 32 motorways currently featured that lie at least partially in traditional Lancashire. Next up is Yorkshire with 14, and Cheshire with 13. Which motorways featured are the geographical extremes (most northerly etc.)? Which is the most secretive motorway? I'd say probably the M96, which appears on zero maps and zero signs. Well, zero public signs anyway! Which is the most unfinished motorway featured? Of all of those that were partially built and are open today, probably the M67. Both ends feature an unfinished junction, and only 5 out of a total of 35 miles were constructed. Otherwise, it's probably the M12. Of all the 57 mile route planned, all that was actually built is a bridge that takes the M11 over the emptiness where the M12 should be, and two tiny stubs where sliproads should be. There are, of course, several motorways featured where nothing was built. You've said road X is in county Y, but it isn't! Probably the most non-road related messages I get are in regard to counties! Pathetic Motorways has a policy of listing the traditional (or pre-1974) counties that motorways are located within, rather than using modern administrative boundaries. The reason for this is simple - modern terminology and legislation is a complete mess, and I only want to let people know where things are in an easy to understand fashion. In legalese, modern Unitary Authorities are described as "Administrative Counties" in their own right, so you get nonsense like "County of Blackburn with Darwen". Yet Metropolitan Boroughs that are functionally identical to Unitary Authorities aren't counties in their own right, but part of Administrative Counties where no administration is carried out at that level! Obviously, the majority of built motorways have been documented by a visit, sometimes by visitors to the site. There is also much that can be found in old mapping for the "Lost" and "Unbuilt" section, in both Ordnance Survey mapping, and in other sources of mapping data. Pulling all of this information together isn't the easy task that you might think. There's no mythical box with "motorway plans" scribbled on the outside in marker pen. Often there will be what sounds like an interesting document that when you get hold if it is perhaps simply a letter acknowledging receipt of something. Sometimes documents are virtually impossible to get hold of - would you believe, for example, that Birmingham City Archives have absolutely nothing on the major civil engineering project that is the A38(M) Aston Expressway? Even though they were the construction authority, rather than central government? Sometimes, though, you just get lucky and some amazingly crazy plans (like those for the M13) drop into your hands! Do you actually have a life? Are you in favour of more or better roadbuilding? Pathetic Motorways is neither in favour of more roadbuilding, nor in favour of tearing everything up! It is merely a study of what exists and what was seriously planned by a governmental body, be it national, or local. It's not meant to be a political statement in any way. Well, whilst most motorways planned by Central Government have had at least some research done on them (or at least we know that they exist, even if they haven't appeared on here yet), plans made by Local Authorities, or the Scottish or Welsh Offices are more difficult to get hold of. Do you know about an unbuilt motorway plan within your local area, that's not included on here? Perhaps just a bypass, or a motorway link? If you have any information, please contact me - I'd love to hear from you, no matter how much or how little information you can offer.